One thing I had been looking forward to a lot about moving to Amsterdam was the fact that here exist several networking events for women in technical companies/technical professions, i.e. mostly in IT. A lot of them seem to be organised via Twitter or Meetup (a platform whose benefits I'm only just now starting to discover! Ah, the possibilities!) So far I've discovered the PythonLadies, the RailsGirls, the PHPWomen and, less technology-specific: Girls in Tech and the Girl Geek Dinner. Considering that Karlsruhe, where I've lived before, is also considered a somewhat big technology and innovation hub, it's a little sad to see how few girls' networking events take place there: virtually none. I guess it's just a different culture here. Or there really aren't enough women in tech back home. So, as soon as the date for the September edition of the Girl Geek Dinner here was announced, I just had to sign up! 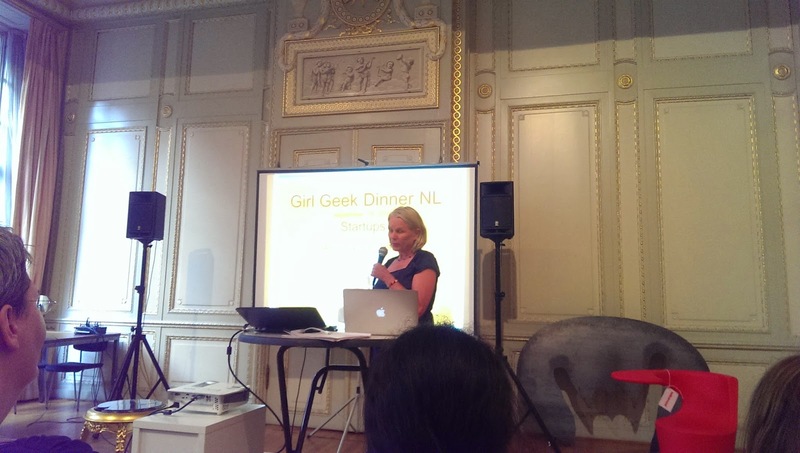 The Girl Geek Dinners are a world wide organisation who promote women in technology. In Germany they seem to be a bit underdeveloped, unfortunately, thats why I only came across the organisation when I moved here. The dinners usually feature one or several speakers for varied topics, usually women, and a buffet style dinner. Men are allowed to attend as well, but only as long as they're invited by a woman - every woman can invite one man, like this women will never be outnumbered by men. The topic for September's GGD in Amsterdam was "Start-ups" and was hosted in the beautiful premises of Rockstart on Herengracht. The evening started out with drinks and socializing and me being a little shy, but I soon got into conversation with some other first-time attendees. And there were really only women! No men! And all of those women were working in technology! The talks were rather impressive as well - especially since at least 2 speakers were a lot younger than me. At 22, I was still way too clueless to be even remotely thinking about founding a company (and I probably still am).